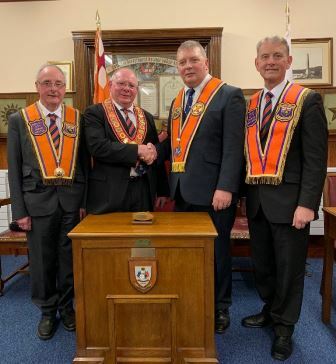 The City of Londonderry Grand Orange Lodge work under the auspices of the Grand Orange Lodge of Ireland and are a unique Grand Lodge in the sense that we are the only "City" Grand Lodge. We comprise of 5 District Lodges, spread from as far apart as Manorcunningham in Co. Donegal, (Rep. of Ireland) to Eglinton & Claudy on the outskirts of Londonderry. Along with the 5 District Lodges, 24 Private Lodges make up the City of Londonderry Grand Orange Lodge. Wor Bro Derek Reaney (Assistant Grand Master) pictured congratulating the newly installed City Grand Master Rt Wor Bro Donald Eakin. Also pictured LEFT Deputy City Grand Master Wor Bro George Hunter, RIGHT Past City Grand Master Rt Wor Bro Maurice Devenney.